Fire Hall Spring Concert Series! Sound the alarm it’s concert time! These free, all ages concerts located in various Vancouver and North Vancouver Fire Halls are sure to be the city’s hottest ticket featuring Will’s Jams, Bobs & Lolo, Jim Byrnes and Petunia & the Vipers live in concert! Mark your calendar for May 27 – June 2, 2019! The Vancouver International Children’s Festival will be back at Granville Island this spring ready to delight, enchant and engage your students. Both Public tickets and School tickets are on sale NOW! View the 2019 lineup. We would like to respectfully acknowledge that we work and play on the unceded territories of the Coast Salish peoples of the xʷməθkʷəy̓əm (Musqueam), Sḵwx̱wú7mesh (Squamish), and səl̓íl̓wətaʔɬ (Tsleil-Waututh) Nations. Please note that Project Soul will NOT be performing at the 2019 Festival. Similar dance group, Immigrant Lessons-101 will be replacing Project Soul on the 2019 Lineup. 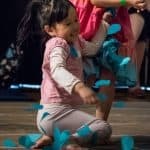 A joyous and stimulating experience for the youngest of audiences, Paper Playground is a rare opportunity for the very young to experience live theatre created with and just for them.